This year on Veterans Day we celebrate the 100thAnniversary of the armistice, which ended the World War I hostilities between the Allied Nations and Germany in 1918. World War I, at the time referred to as The Great War due to the sheer magnitude of the conflict, ended on “the eleventh hour on the 11th day of the 11th month”. The public holiday of Armistice Day, declared by President Woodrow Wilson on November 11, 1919, was originally a day set aside to honor the veterans of WWI. In 1954, legislation was passed amending the name of the holiday to Veteran’s Day, a day to honor veterans of all wars. With knowledge of that history, and with deep gratitude to all veterans, we would like to thank all CESCO employees who are veterans for your service to our country. Your courage and devotion to our country is admirable. Thank you from the Schmid family. 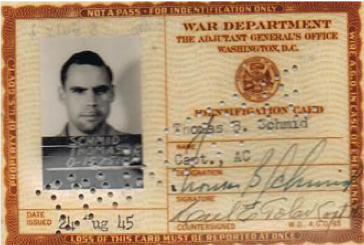 The vignette for this month focuses on Tom Schmid, a veteran of WWII. I hope this vignette prompts many of you to share stories about your military service or the service of others in your family. These stories of patriotism and love of country deserve to be heard. Unfortunately, “the war to end all wars” did not achieve the desired outcome. Within two decades there were signs of escalating conflicts throughout the world. The unrest in Europe was clearly on everyone’s mind when Tom graduated from the University of Notre Dame in 1940. While the US had not yet experienced the aggression of Pearl Harbor which brought us to war, the draft was enforced and young men across America were assigned a draft number. Tom, however, while awaiting his draft number in his last semester of Notre Dame in the Spring of 1940, was accepted into the General Electric Business Training School. That fall, while living in Connecticut, he sent this telegram to his parents on Oct. 29, 1840 inquiring about his draft number. His mother responded with his draft number and the news that his number had not been called up. While this was likely good news for Tom, it did not last. On January 14,1941 he received additional communication from the Selective Service. He was told to report for a physical on January 20, 1941. 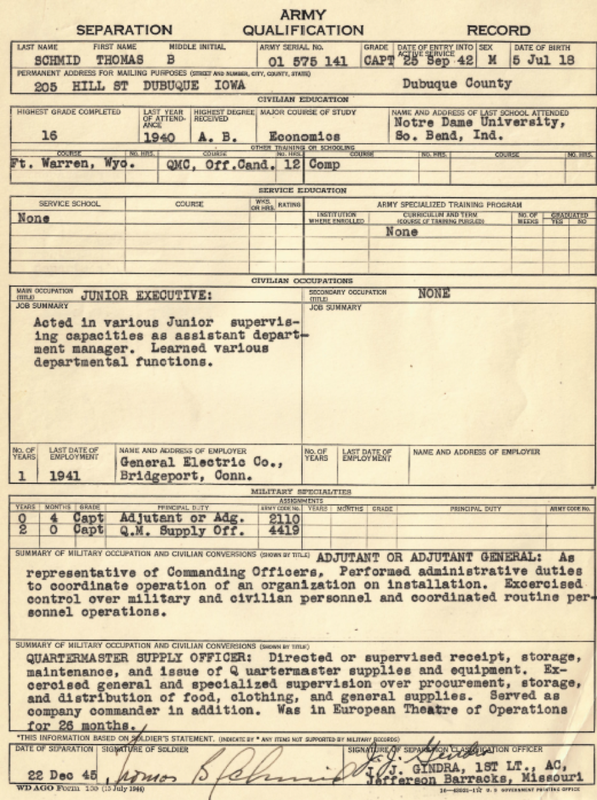 After his physical, he received notice on 2/14/41 that he was eligible for service (Class 1A). A day later, he received a notice that he was eligible for military training (Class 1D). In June of 1941, Tom submitted a Statement of Information requesting deferment of the draft until June 1942 while he completed the GE training course. On August 21, 1941 Tom received a letter informing him that his request for deferment had been denied. He was to be inducted into the service on September 24, 1941. Tom sent his parents a telegram to tell them the news. The Telegraph Herald reported the names of the men chosen by the Dubuque County Board to meet the September quota. Tom was on his way to the induction center at Fort Des Moines. Tom sent his parents a telegram on September 25, 1941 letting them know he was accepted in the army for Selective Service training. Tom (on the left) at Fort Des Moines (October 1941). Just a week ago today – man, seems like a month. Will try not to repeat and have John read his for further information. (Editor’s note: John and Jim Schmid shared mail from Tom while they were attending school together) I have been assigned to Administration and Personnel School so maybe I can fight the war with a pencil. Will drill here for at least thirteen weeks then will be transferred. Hope everything is okay with you. Drew KP last Saturday at Fort Des Moines at 3­:30am, man alive. 1942 Tom home on leave before deployment. This video shows Tom marching in uniform with his siblings following him around the back yard. Tom leaving for WWII after a leave to visit family. Tom saved this flyer that the airmen were required to carry with them in case they were shot down in Russian controlled territory, “Worn by aircrews of the 8thAirforce when flying over Russia lines in 1945.” Russia was a member of the Allied Forces in WWII but, of course, there was a language barrier. Tom and his military mates celebrate Germany quitting the war. 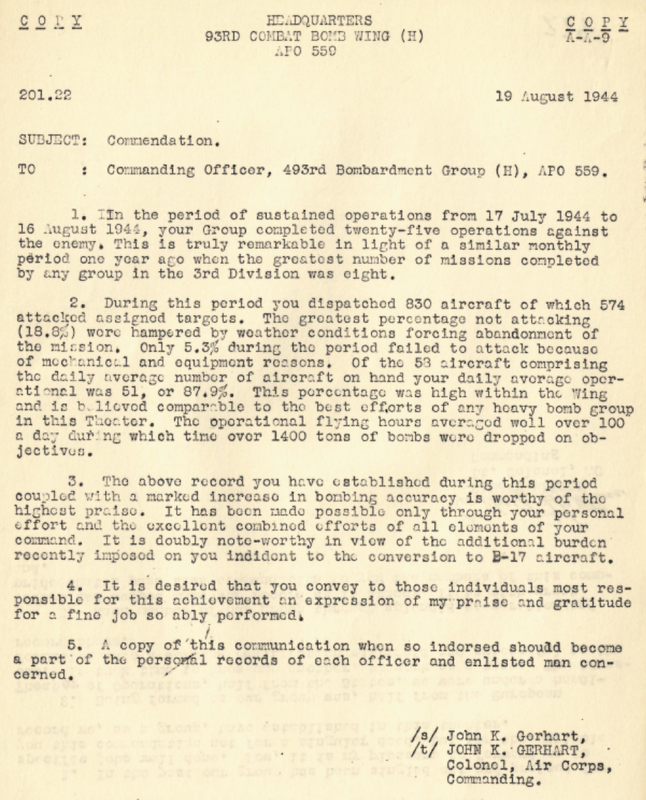 Commendation received by Captain Thomas B. Schmid on behalf of the 493rdBombardment Group. Tom is officially released from the Army on December 22, 1945. Military discipline and adherence to duty were not lost on Tom Schmid, nor quickly forgotten, upon his reintroduction into civilian life. Also, not forgotten were the lessons of war, and the commendation his unit received for working not as individuals, but as a unit, to accomplish their mission with distinction. These traits Tom Schmid brought back to Crescent Electric. They served him and the Company well as he rose within the ranks of Company management, helping his father lead the Company into the Company growth in the 1950’s and 60’s. Tom easily understood that for the expansion of the Company by branches to succeed, each branch must be contributing to the whole, but needed to function cohesively as their own unit. Tom’s brothers, Jim and John, did not qualify for military service. Bill, who was too young for WWII, did serve in the Korean War in the early 1950’s. This is a photo of Bill in August of 1951 at the military base in St. Louis. Most of the next generation of Schmid’s were too young for military service during the Vietnam War. The oldest two male cousins participated in the draft but the war ended before they were called up for duty. Our sincere thanks to all Veterans!